This weekend I traveled to Bristol, Indiana to speak to the Elkhart County Genealogical Society. Had I practiced what I preached my journey there and back would have been more enjoyable. My 6AM flight from Phoenix, Arizona to Chicago, Illinois went fine. 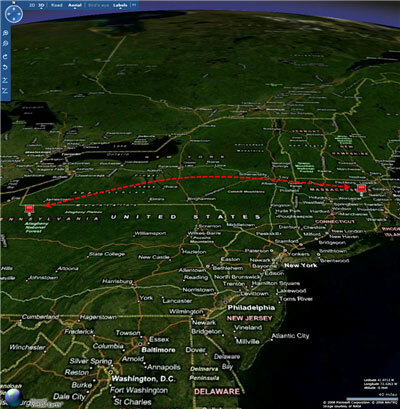 My flight from Chicago to South Bend, Indiana was supposed to have left shortly after my arrival to Chicago. Running through the terminal I arrived at the gate only to learn that my 1:00 departure was delayed until 3:45. Not a big deal, delays happen. I ate lunch. When the airplane arrived at 6:00 they learned it had mechanical problems and switched us to another airplane which left Chicago after 8:00 that night. Shortly after takeoff the pilot mentioned that our short trip to South Bend would only last 15 minutes. I waited 7 hours in Chicago for a 15 minute flight. Had I known South Bend was so close to Chicago I could have easily taken a bus and arrived in plenty of time to relax and prepare for the seminar the following morning. The seminar went great. My airplane was to leave the next morning at 9:20. Not too bad, even got to sleep in a bit for a change. When I arrived, the agent announced that our flight was cancelled and that they automatically booked me on the same flight the next day. Well, I learned from my mistakes, and took a bus to Chicago - a short 3 hour drive. I managed to get a stand-by ticket and arrived home in Phoenix just a few hours later than expected. I recently spoke with a researcher at a conference who has struggled on their ancestor for 30 years. Their family group record stated that John Smith was born in Woodstock, Windham County, Connecticut in 1717. 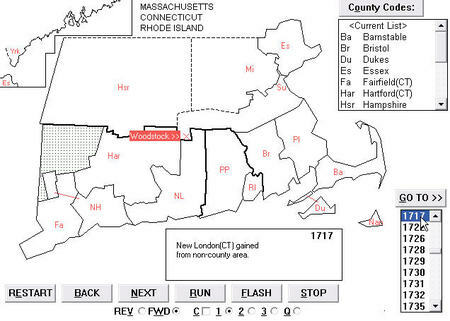 This map, taken from AniMap, is what Connecticut looks like today. 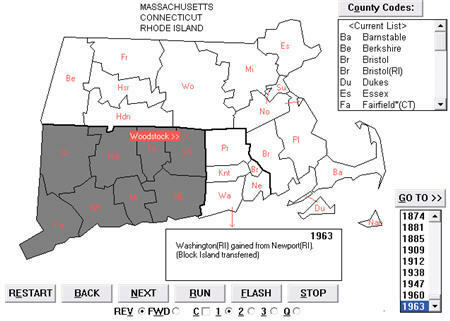 Sure enough, Woodstock is in Windham County, Connecticut. However, using AniMap you can select the year, and AniMap will show you the county boundaries as they existed at the time. 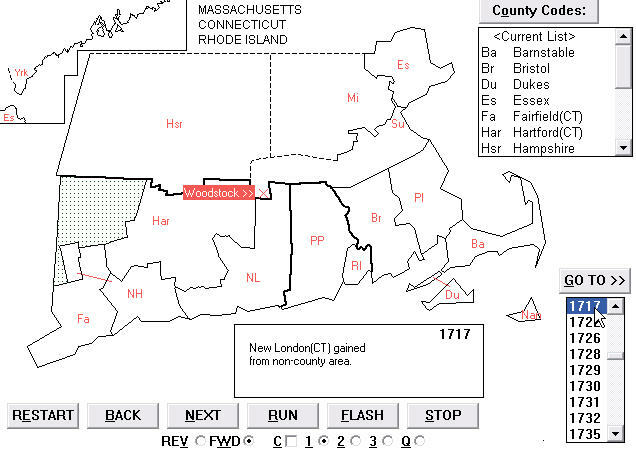 The map below shows that not only was Woodstock not in Windham County in 1717 (it was in Suffolk County), it was in a completely different state - Massachusetts! Knowing this, the researcher should be looking in Suffolk County, Massachusetts records for the time period. Legacy will also produce a report of all of your locations, displaying potential historical location problems. This report is accessed by clicking on the Tools menu, then clicking on USA County Verifier. If you are a single female with a desire to attend this year's Legacy Genealogy Cruise to Europe, please contact us. We need a roommate for one of our female Legacy cruisers to share an inside cabin. For more information about our 5th annual Legacy Genealogy Cruise, please visit http://www.legacyfamilytree.com/CruiseInfo_2008.asp. For more information, please contact our cruise coordinator, Christy Downing at christy@agelessway.com. If you have a digital camera or a scanner, this book (available for download) is a must-have. It explains all the rules and "mine fields" for digital imaging. Learn about easier scanning, using sound, digital cameras, video and GPS, making digital scrapbooks, creating hard-bound books, preservation & archiving, and much more. *Only $14.95 until April 30! You save 25%. No special coupons required. Chapter 1 - Where to Begin? Are you frustrated trying to determine the best place to start organizing all your family history photos and files? The Guidebook will provide you with some easy and logical ways to get started. Doing it right the first time will save time, money and frustration later. Quality scans make a big difference when printing or zooming in on photos later. Step-by-step instructions are included such as the five most important steps to a great scan and more. Using sound is easier than you think. All you need is an inexpensive microphone or a cable to attached to your cassette recorder. Use a microphone to tell stories, create oral histories. Learn to edit your narrations.Copy the priceless old cassette tapes to your computer with recordings of grandma or other family members. Save time, money and get better quality by doing it yourself. Internet links are provided for free sound editing software. Chapter 4 - Digital Cameras, Video and GPS Managing and finding your photos later and suggestions for buying a new camera are included . Converting Old Home Movies - do's,& don'ts. Read this chapter BEFORE you invest a lot of money getting your old movies converted to a DVD.Why You Need to Start Using GPS. New and fun things you can do - free software links. 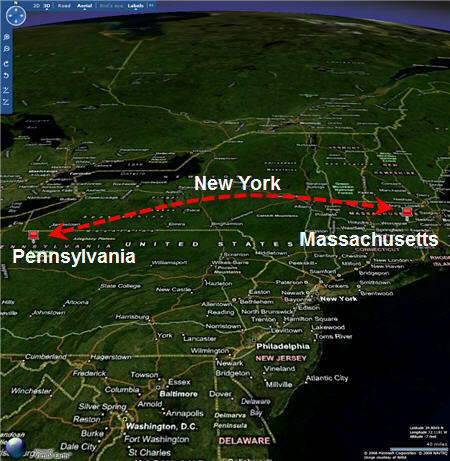 Adding screen captures of satellite images is both fun and adds realism to family history. Chapter 5 - Digital Scrapbooking Presents a different perspective about how to take advantage of new technology and samples of how to create digital scrapbooks. Something new and very different from traditional scrapbooking. Chapter 6 - Interactive Storytelling Stories are a real treat and the spice of life. This chapter offers some excellent suggestions that will help you put new life into old stories. You will discover some new ways to tell stories and make them more interesting. Mixed Media Collections. Are you struggling with how to organize ALL your materials - photos, sound files, video clips, text documents, PDFs and other file types? The Guidebook will show you how to make your file collections more useful and organized. Chapter 7 - Creating a Bound History Ways to save money and things you need to know and avoid BEFORE you begin. What's Paper grain? Have you even opened a book that resisted staying open? Have you seen a book with a broken or cracked spine? These are few of the symptoms of a book that has been printed and bound with the paper grain running in the wrong direction. There is much more you need to know. Chapter 7 takes you through each step required to create a beautiful history or biography. Checklists and simplified instructions will make it easy. Chapter 8 - Preserving & Archiving Ways to find and protect your treasures while saving hard drive space. Don't wait until you have a hard drive crash or a virus attacks your computer. Chapter 9 - Understanding Your Computer Basic computer terminology is explained in everyday terms. Computer hardware is explained. If you are gong to buy a new computer you need to read this chapter first. Suggestions for maintaining your computer. * Available as an electronic book only (PDF). Legacy Charting, software that creates large-scale wall charts of your family tree, now has new background images available for free download. 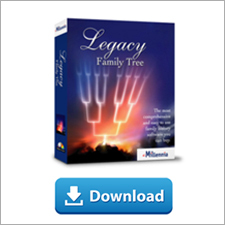 Legacy Charting will be included with the soon-to-be-released Legacy Family Tree 7.0. This special pre-release edition of Legacy Charting is available for free download and will be fully functional through June 15, 2008. Download it here. When you install Legacy Charting, it includes a collection of 40 background images and textures. We have now created a special Backgrounds page on the Legacy Charting website where you can download additional high-quality background images, or even contribute your own digital pictures to share with other "wall-charters". Visit http://www.legacycharting.com/backgrounds.htm to download the new images or share yours with us. Click on the Appearance tab, then click on the Background button. Click on Select image, select your desired image, and click Open. In the Display Options, select your preferred option. Stretch to frame works well with larger images. Finally, adjust the transparency. Then click anywhere on the chart. While browsing FamilySearch's new Record Search site, I noticed that they had recently published a state-wide index to Washington's death certificates for 1907-1960. In fact, Record Search is beginning to add quite a collection of free indexes and images, thanks primarily to the wonderful FamilySearch Indexing project. I've previously used the microfilm version of this index to locate members of my Brown family who died in Washington, but in some places the filming was so bad that it was very difficult to locate any of the family. In particular, I have been searching for the death of Amelia Shopfer, who was born abt 1874 in Ohio, the wife of Ralph L. Brown. I knew that she died sometime between 1930 and 1951, probably in Washington. As I prepared to search the index, my heart raced because of my anticipation. I typed in her name, entered her approximate birth year and clicked search. The third entry in the list was her!!! It listed her exact death date and place, her age at death, her spouse (Ralph L.), and even her parents. Time for another Genealogy Happy Dance! Thank you to all FamilySearch Indexing indexers for your hard work in making this index available. To learn more about the world-wide indexing projects, visit www.FamilySearchIndexing.com. To search this database, or any of the others, visit http://labs.familysearch.org and click on the Record Search link. You will first have to register (free), and then you will have access to the collections. (Montreal, QC – April 8 2008) Ancestry.ca, Canada’s leading family history website, today announced the online launch of the fully searchable indexes for the historic Drouin Collection, which contains Quebec records spanning 346 years from 1621 to 1967. Starting with 29 million names for the years 1850 to 1967, the indexes will include 37 million names in baptism, marriage and burial records, and also a compilation of church records from Ontario, Nova Scotia, New Brunswick and various New England states, when complete in mid-2008. From the early 1600s, the Catholic parishes of Quebec kept meticulous records of their members’ baptisms, marriages and burials. The Quebec Government soon required the Catholic Church to provide it with copies of all its records and in doing so became the central holder for Quebec’s vital records. In 1899 a lawyer named Joseph Drouin founded The Drouin Genealogical Institute, using Quebec’s vital records to research and sell family genealogies. His son Gabriel assumed stewardship in 1938, dedicating himself to microfilming and indexing Quebec’s vital records; this important work formed what became the Institute’s principal reference collection. The collection remained the property of the Institute until Gabriel’s death in 1980, after which it was sold to the genealogist Jean-Pierre Pepin who created The Drouin Institute, which was dedicated to preserving the collection intact and in Quebec. Recognising its historical significance, Ancestry.ca secured the right to host the collection online. It launched the original images – more than 12 million in total – in 2007, and in partnership with The University of Montreal has now indexed the collection to make it searchable online for the first time. The Drouin Collection can be searched in French or English language by name, date, place, church or institution, and religion. * At launch the indexes will contain 29 million searchable names. The remaining eight million names will be live on Ancestry.ca by mid-2008. Searching is open to subscribers of Ancestry.ca. Visit www.ancestry.ca/drouin for more information. Recently a major new database was published online for Missouri researchers. The Missouri State Archives announced that the Missouri Death Certificates from 1910-1957 were now indexed, linked, and available for free online searching. Since some of my ancestors died in Missouri, I now want to search for and obtain the death certificates I lacked. Using Legacy Family Tree's search tools, it was easy to identify those ancestors who died during this time period in Missouri. In Legacy, click on the Search button in the main toolbar. Enter the criteria as shown in the image below. The resulting list is a list of everyone in your family file that died in Missouri between 1910-1957, and will likely have a death certificate in the database. From the Search List (which is just a filtered version of the Name List), click on the Print button at the bottom. Click on the Preview button to see what the report will look like before you print it, or the Print button to print immediately. Click on the button with 3 dots next to a field name that you would like to replace. Click on the desired field name, and click Select. Make sure there is a check mark next to the new field. To change the report title, click on the Options tab, and type the desired title. Locating obituaries for our ancestors is rewarding, although sometimes challenging. Legacy Family Tree makes the experience easier by helping you locate those ancestors for whom you have not yet located an obituary. I've been trying to learn about my end-of-the-line ancestor, Lewis King, who was born about 1807 in Germany. Experience has taught me that clues to his ancestry may be found in the records of his children and grandchildren. First, when you find an obituary, in the Individual's Information screen, click on the Add button to create a custom fact/event. Add the Event's name (Obituary), its date and place. Then in the Notes section, transcribe the obituary. To add the Obituary column in the Descendancy view, first click on the Descendancy tab. Click on the Options button on the right and click on Customize Columns. Where there is an empty field name, click on the button with the three dots. In the Field Names to Display screen, select Event, then select the event name of Obituary. Now you are easily able to not only view the person's descendants, but you can also easily visualize which of these descendants do not yet have a recorded obituary. If you have a favorite Legacy tip and would like to share it with others, please send us an email. 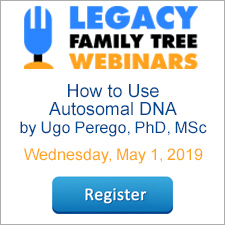 If you have ever searched a database for an ancestor and did not find what you were hoping for, it is still possible that your ancestor is there. They may be "hidden" behind a variation of the surname that you had not thought of previously. If I searched only by the one surname with which I was comfortable, chances are I would not find Christian. Successfully searching databases and indexes requires the researcher to be creative. Put yourself in the census enumerator's shoes for a moment. He had a lot of work to do in a small period of time. I hesitate to believe that he would verify with each household that he spelled their names correctly. He probably wrote down the spelling of the name that was most familiar to him and moved on to the next house. Fortunately there are some good resources available to help researchers come up with spelling variations. At MyTrees.com, when you click on the Name Variants link on the home page (you might have to do a Control-F to find this phrase as it is easy to overlook) you get a screen where you can enter your ancestor's surname. Click on Find Spelling Variations and you will get a list of many other ways that the surname could have been spelled based on how the name sounds. Click on the image below for an example. This free software will also display other possible variations of surnames. We previously published information about it here. Standard Finder is a new project published by FamilySearch. Here, you can search for a surname and it, too, will return a list of other possible variations. Click here, and then scroll to the Standard Finder section. If we are going to find our ancestors, we must develop creativity and imagination when trying to come up with variations for our ancestor's names. When we cannot think of all potential variations, MyTrees.com, Surname Suggestion List, and Standard Finder are good resources to turn to.